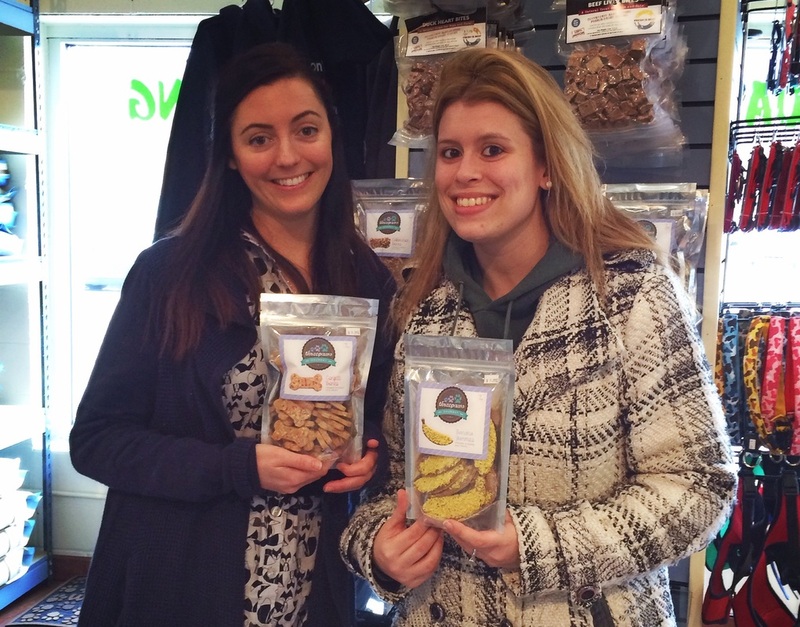 Hannah (left) and business partner Alex (right) took their bright idea to the next level, launching Threepaws Gourmet in 2014. 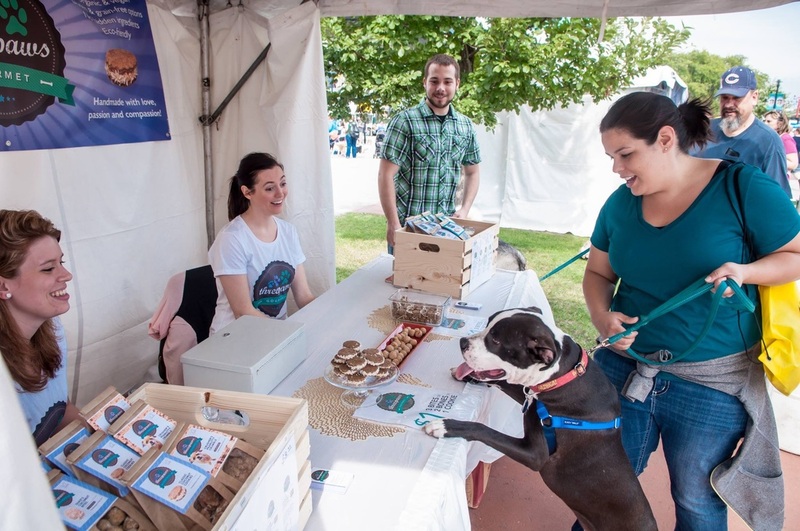 "Dog treats are not regulated like dog food, so it’s harder to know what you’re getting"
Besides the company website, Threepaws Gourmet dog treats are available at Portland's Food Fight! Grocery, Rabbit Food Grocery in Austin, TX, Happy Paws in Milwaukee, and Amazon.com! "A good idea does not come and go, it comes and grows. How you launch your business sets the foundation for growth, so take the time to give it the thought it deserves"
We asked Hannah, a longtime vegan, to share some of her healthy-living habits, and she graciously obliged us. Yay! Getting a back scratch . . . never understood why spas don't offer that service. I can’t get enough of Juice Beauty and100% Pure. Also, everyone should add “Lily of the Desert Aloe Vera Gelly” to their daily facial routine. What edible human treats are on your hotlist? "Sometimes there’s the notion that you have to be burning the candle at both ends to succeed, but I just don’t think that’s wise all the time"
Want to see Threepaws treats at a store near you? Ask your local natural food store or pet-supplies retailer to carry them! In 2014, Seattle native Hannah Anderson was thumbing through her copy of Chloe Coscarelli’s award-winning cookbook Chloe’s Kitchen when inspiration struck: Why not combine her passion for veganism and animals, and launch a business built on providing delicious, healthy treats for dogs? Anderson, who is “mom” to a rescue dog named Layla, already loved to experiment in the kitchen, and possessed an entrepreneurial streak from an early age, so taking a good idea to the next level made sense. Together with her partner Alex, she launched Threepaws Gourmet in the city they both call home—Milwaukee—and vend their vegan treats to a growing clientele of dogs and their people throughout the country. 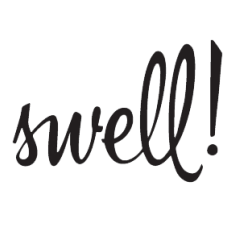 Here, Hannah shares her story and some great ideas for fledgling entrepreneurs who dream of taking their great idea to the next level, too. 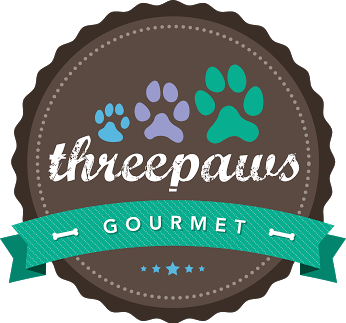 You launched Threepaws Gourmet in 2014. How did the idea for this business come about? Yes! September 1, 2015, will mark our one-year anniversary, and so much has already happened--it’s crazy! Chloe Coscarelli actually got me started on the dog treat track before I even realized it was a passion. She probably never expected to have someone like me gain so much inspiration from one simple dog treat recipe that was probably thrown into her cookbook Chloe’s Kitchen as a bonus! Dog treats are not regulated like dog food, so it’s harder to know what you’re getting. As our motto states: we love “Raising the Bone on Dog Treat Standards.” Our twist is to have mass fun appeal within the gourmet healthy dog-treat sector. In a world of artificial ingredients we value working with simple, high quality, and often locally sourced ingredients. I remember scouting out potential dog treat competitors online and thinking how confusing some websites were, or how they didn’t disclose all their ingredients. I found myself determined to offer a clean website design with no hidden ingredients. I feel that transparency and integrity can get one far in business because a big part of being successful is earning (and keeping) the trust of your customer base and contacts. My business partner Alex has always known she’d love to work with animals in some meaningful capacity. She has an adorable pug named Duke (who likely holds the current record for most likes on our Instagram account)! Alex's dream is to one day foster pugs with special needs from within her home, all while helping run our business full-time. It's a heart-warming thought for me to picture her baking with a bunch of excited pugs prancing around at her feet. Tell us how you and Alex came together as a team. 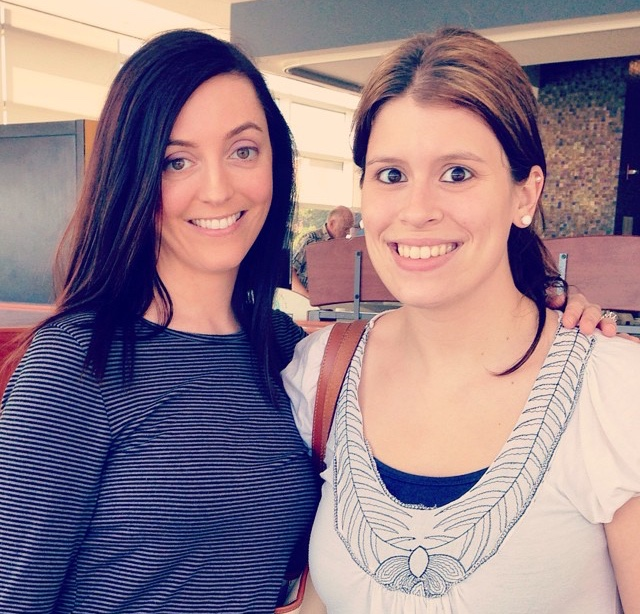 We met roughly three years ago, when I started my first job in Milwaukee. We both work for a large institution and have developed many skills along the way that have helped us run our business. Alex and I have complementary strengths, which I learned from working with her on a daily basis. It’s a beautiful thing to be able to share this passion with my friend, knowing that she’s equally passionate. What were some of the issues you considered before launching a business together with another person? I’m sure we both asked ourselves these questions over and over: “Can I trust this person?” and “Is this person as passionate as me?” The answer to both was a consistent and resounding YES. As for who did what and why, well, that’s the great thing about us . . . she sees one of my strengths as coming up with ideas and I see one of her strengths as being able to execute ideas. We're both dreamers and doers to some extent. Tell us about your customers! 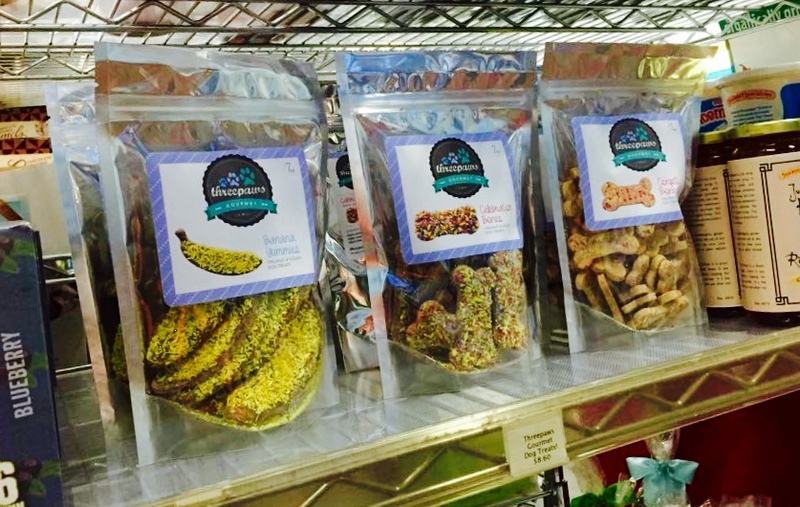 We love making healthy dog treats fun, which includes offering a variety of gluten- and grain-free options. We want to check all the boxes for people’s concerns. We see our treats standing out against a sea of brown in the healthy dog section. Our ideal customer is someone who values giving their dog(s) a long, happy, and healthy life. Our customer loves their dog(s) enough to care about the smaller details such as treats. We hug and kiss our dogs as much as we can and every day they eat our treats, which is just another way for us to manifest our love for them. Usually people reach out to us through social media, especially our website. Shows have proved to be a great way to make connections. We're thrilled at the positive feedback from stores such as Food Fight! Grocery, in Portland, OR, and see it as just the beginning. If you were to mentor another ethical entrepreneur who was thinking of starting her own business, what advice would you offer her before she got started? 1) Don’t let go of your driving force: passion. For all those with a burning passion but no direction hold on, hold on to that fire in your belly. Ideas come and go, but real passion is not something you can fake. Preserve it, even if there are days when it seems to gnaw at you . . . the right time will come for the right idea, and when it does, you’ll be ready! 2) Know it’s a good idea. If you don’t believe in it, why should anyone else? A good idea does not come and go, it comes and grows. How you launch your business sets the foundation for growth, so take the time to give it the thought it deserves. Anticipate the needs of your company because it will translate into the needs of your customer. 3) Pace yourself. There have been times I’ve felt pretty overwhelmed (just ask Alex!). However, a lesson we’re learning day-to-day is that although having a business plan is important, knowing how to pace yourself (when to stop, when to push, when to breathe) is an extremely valuable skill. I think sometimes there’s the notion that you have to be burning the candle at both ends to succeed, but I just don’t think that’s wise all the time. Life is circumstantial, which is why good judgment comes in real handy. We like climbing higher, but we also like to stop and enjoy the view. For us the journey IS living the dream. What is the most important lesson you’ve learned throughout this experience? Ups and downs are inevitable but having stability within yourself and the company is vital. Remain a nice person and extract the good from every challenge. I know it may sound cliché but being kind is definitely not overrated. Great quote for life and business: “I've learned that people will forget what you said, people will forget what you did, but people will never forget how you made them feel." We have a long-term business plan in place with short-term milestones built in. A storefront would be really fun; as I often say, we're poised to be “the Harry & David of dog treats.” But for now, our focus is to just see where the numbers take us. Arms in the air - we’re ready!